Nanoskin Mega Trend Inorganic Coating is a state-of-the-art inorganic paint coating that provides up to 3 years of paint protection. By using advanced inorganic diamond carbon technology, Nanoskin Mega Trend shines and protects your vehicle better than anything else available. Once treated with Nanoskin Mega Trend, your vehicle will repel dirt, water and contaminants while maintaining a hard-as-nails, liquid-like shine. Nanoskin Mega Trend Inorganic Coating works on a molecular level of 10 nanometers to fill in microscopic pits and pores in the paint. Nanoskin Mega Trend creates such a hard shell of protection that treated surfaces will be less susceptible to scratching and marring. 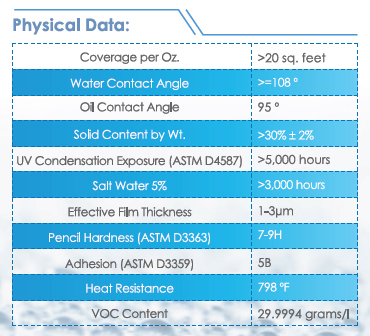 The immense amount of surface tension and high water contact angle created by Nanoskin Mega Trend Inorganic Coating causes water to sheet off the surface, taking dirt and other contaminants with it. Once cured, Nanoskin Mega Trend Inorganic Coating cannot be removed by alkaline cleaners or other harsh detergents. The only way to remove Nanoskin Mega Trend Inorganic Coating is to physically abrade it off the surface with an abrasive polish. What’s more, Nanoskin Megatrend can be applied to wheels, exterior glass and headlights. The Nanoskin Mega Trend Inorganic Coating System is incredibly easy to use. Mega Trend is only offered in a kit to take the guesswork out of how to properly prep the surface.